“I never really thought that at 57 years old that I would be diagnosed with cancer myself,” he said. It was two weeks since the day that he had undergone surgery for prostate cancer at Vanderbilt University Medical Center. He had spent that time surrounded by family, playing with his dogs, indulging on chicken wings and trying to heed doctor’s orders to not over-exert himself — a difficult endeavor for a man accustomed to riding horses, raising cattle or hunting when he isn’t running the nation’s largest barge company among other businesses. 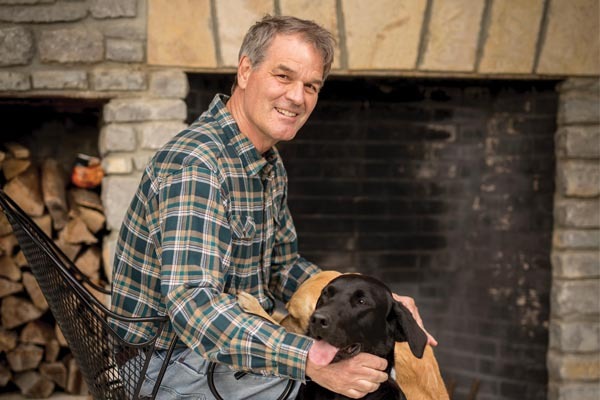 Ingram describes himself as a “mercenary” for Vanderbilt-Ingram Cancer Center (VICC), where he’s chair of the Board of Overseers, a volunteer group of supporters and advocates. The center is named in honor of his father, E. Bronson Ingram, who died at age 63 in 1995 after being diagnosed with cancer of an unknown primary origin, cancer that was not caught early and had spread throughout his body. Noting that his father had elevated prostate-specific antigen (PSA) levels, Ingram said he believes the cancer likely originated in the prostate. An annual physical alerted Orrin Ingram’s primary physician that he should be checked for prostate cancer. His doctor had been carefully monitoring his PSA levels and noticed changes over a period of time that might indicate prostate cancer. She referred him to Sam S. Chang, MD, the Patricia and Rodes Hart Professor of Urologic Surgery and vice-chair of the Department of Urologic Surgery. Vanderbilt’s urology program is among the nation’s top 10, according to the 2017-18 edition of “America’s Best Hospitals” by U.S. News and World Report. The tests confirmed Ingram had localized cancer. Though frightened and distraught by the news, his wife, Lee Ann Ingram, and children rallied around him as he weighed the treatment options Chang set forth. Ingram underwent a robotic prostatectomy on Jan. 3. The surgery was done laparoscopically through small incisions in his abdomen. Orrin Ingram and his family opted to take an aggressive approach to treatment when he was diagnosed with prostate cancer. He underwent a robotic prostatectomy at Vanderbilt earlier this year. 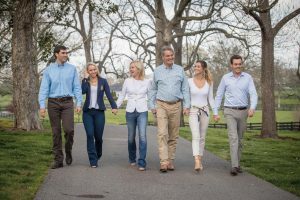 From left are son Aaron Barrett and his wife, Camille, Lee Ann and Orrin Ingram, daughter, Virginia Ingram, and son, Hank Ingram. Other than skin cancer, prostate cancer is the most common cancer in American men, with about one in nine being diagnosed during his lifetime. Ingram, his brother John Ingram and fellow Board of Overseers member Ronnie James recently led an effort that raised $5 million to help defray the cost of genotyping patients’ tumors when health insurance policies won’t reimburse for it. Genotyping can help physicians determine best treatment options, especially with metastatic cancers. There is not yet a cure for metastatic prostate cancer, Chang stressed. “Cancer is shocking,” he said. “It’s one thing when you are talking about it, even if it’s your father or another family member. I really did think I would be dealing with cancer in my life. I wasn’t ignoring it. But I thought it would happen in my 60s, not in my 50s. That’s just how quickly that C-word got personal for me. It makes you think hard. It’s good to have a second chance.